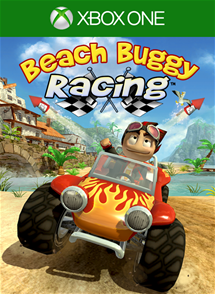 Beach Buggy Racing is a kart racer brought to the Xbox One by Vector Unit. Originally a free to play mobile game, Vector Unit opted to charge an up front cost with everything available without the need for micro transactions. 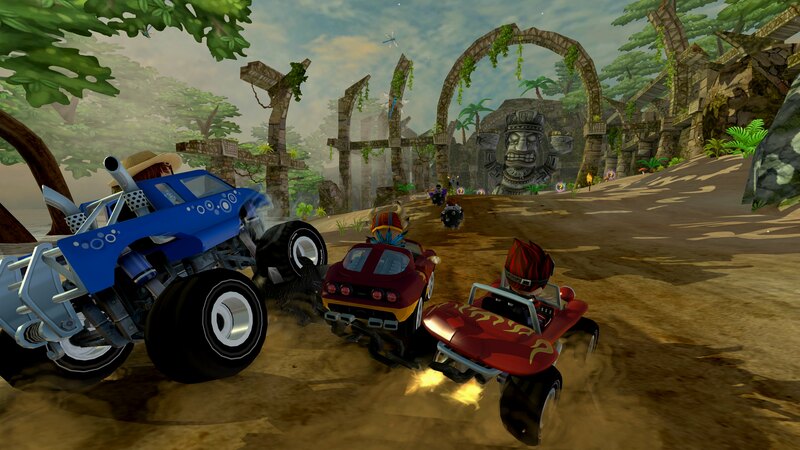 Did Beach Buggy Racing port over to the Xbox One successfully? Let’s find out. 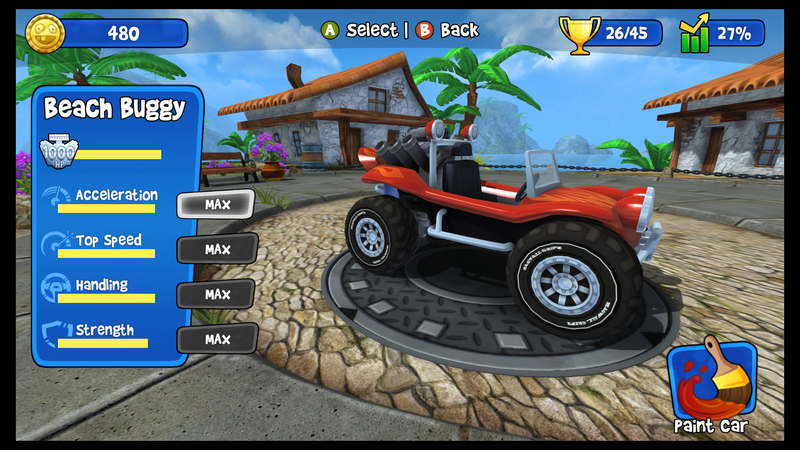 Upon starting up Beach Buggy Racing you are introduced to the game mechanics, controls etc in a quick tutorial. Once you know how to drive, use your special and fire off the power-ups you can pick up around the track you can get into the meat of the game. Something I struggled with was how to boost off the starting line. I looked everywhere in the tutorials and controls and it isn’t mentioned, but it can be found on the main menu under the Pro Tips section (Tap A just before it says GO!). As mentioned briefly above, you can pick up power-ups on the track in the form of question marks in floating bubbles, which is pretty much a given in most kart racers. Although this isn’t a new idea, I found it quite staggering just how many power-ups there are available in the game. I think I must have had at least 10 races before I had seen every power-up. They range from shields to protect from damage to remote controllers that lets you control another driver. 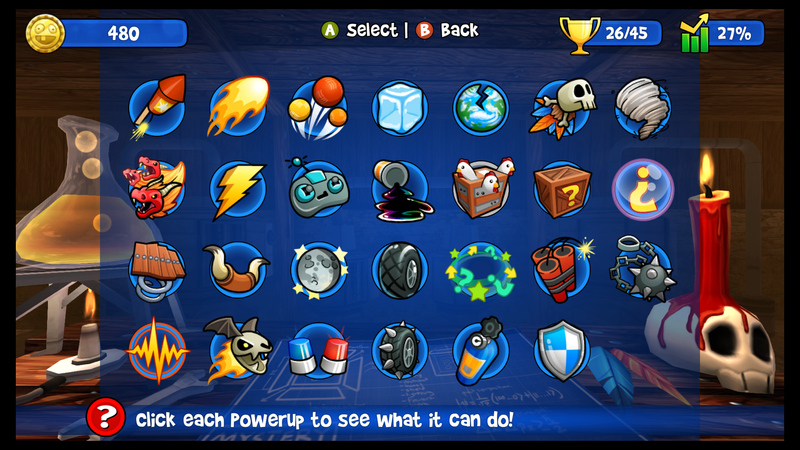 In total there are 27 unique power-ups available from the beginning. No need to unlock them or buy them with coins. I was blown away by the sheer selection. The actual gameplay for a kart racer is brilliant. The graphics aren’t quite next-gen but the amount of fun to be had more than makes up for that. All 15 tracks have their own themes with several shortcuts you need to learn if you want to be able to compete in the latter stages of the game. My biggest gripe with the gameplay was the cheap AI. On countless occasions I would get spammed by homing missiles just before the finish line, or in a one on one the character I was up against would use their special ability over and over during the race. Although it can be annoying, this is part and parcel of kart racers. Just one example of the themed tracks. 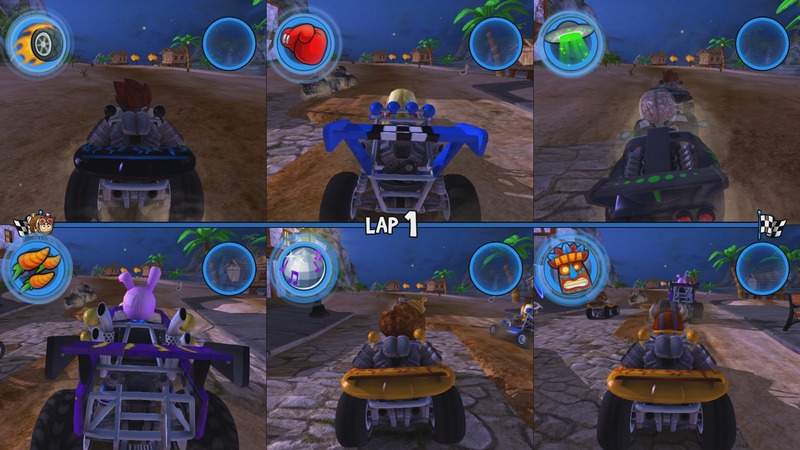 The game consists of five different modes, Career, Daily Challenges, Championships, Quick Race and Split Screen. You’ll probably be spending the majority of your time in Career, which tasks you with gaining 3 stars on every event for each cup. There are a few different events, Race, Boost Blitz, Elimination, Shooting Gallery, Stampede and Follow the Leader. Each event has specific criteria you have to meet in order to successfully gain 3 stars. The final event for each cup has you going one on one against one of the other characters. If you successfully beat them, then you unlock the next cup and that character to use. Why is unlocking new characters such a big deal you ask? Well, each character has their own special ability which you can use once per event. As an example, Rez has the Burning Rubber special which gives you a massive speed boost and leaves behind a trail of fire that can knock your opponents of their vehicles. All the vehicles are unlocked from the get go, but if you switch vehicles, remember that the upgrades are only fitted to the car you bought it for. It can be rough going from a fully upgraded 1000HP vehicle to one that has only just been upgraded to 1000HP. Onto the next mode we have Daily Challenge. Self explanatory really, each day there is a different event and if you complete it you get some coins for your troubles, which increase each day you return and complete another daily challenge. In the Championships mode you have a number of events to complete. If you place 1st overall you get three stars and can progress to the next Championship for that car. Each car has 4 Championships, 100HP, 250HP, 500HP and 1000HP. If you want to complete all of them you are going to have to upgrade all of your vehicles to 1000HP, which is going to take some time. Quick Race is self explanatory as is split-screen. You are able to play up to six players in split screen mode which is nice. I played a few events with my four year old son and we had a blast. The controls are simple enough for younger gamers to have fun whilst still being enjoyable for older gamers too. The biggest selling point for me, by far is the amount of content you get. Had this kept the free to play model, you would have been drip fed everything and it probably would have been tedious to unlock the stuff you want to use in the game, or expensive. With everything available it gives you a vast variety of things to do. With the Career mode alone you’ve got yourselves a decent sized kart racer. For the achievement hunters out there, the achievements aren’t going to come thick and fast. You’re going to need to complete all championships for five cars, earn all three stars in every event in the Career mode and the two that really stand out are for earning 1,000,000 coins and driving 9,289km (both of which I am currently at 6%). There are also some random ones for using certain power-ups which are a bit luck based unless you can do them in split-screen. So if you are a completionist, just be aware that Beach Buggy Racing isn’t going to be a quick completion. Beach Buggy Racing has a lot of similarities to most kart racers, but that isn’t necessarily a bad thing. One of my all time favourites growing up as a kid was Mario Kart and although it isn’t on the same level, it’s good enough to want me to keep coming back for more and put a smile on my face when I play it. The tracks are all unique, the gameplay is immensely fun and the amount of content on offer is pretty staggering. It isn’t perfect though. The AI can be frustrating and cheap at times, the graphics aren’t really next-gen level and there is definitely a need for some online multiplayer. But these are just small annoyances which can most certainly be overlooked. If you’re a fan of kart racers, be sure to give Beach Buggy Racing a go. Posted in Reviews and tagged beach buggy racing, Reviews, Xbox ONE.